Wild camping in the woods during the winter months is something many would like to try but I get the impression some are discouraged by concerns over coping with the cold, especially bedding down for the night in freezing conditions. Certainly, I’m often asked about camping, tarps and winter camping. But sometimes I feel that my answer to a specific question doesn’t always get many more people out camping and bivvying in the winter woods. Perhaps a broader overview would be more confidence-building? When there is snow on the ground or its a bit frosty, people have concerns such as “how do I sleep out in my normal bivvy set up?”, “Do I need to put more clothes on in my normal sleeping bag?”, “Do I need to have a fire?”, “What sleeping bag rating do I need?”, “Am I going to be OK sleeping on the ground in winter?”, “Am I going to be cold sleeping in a hammock in winter?”. All of these questions and more can be going through people’s heads and, frankly, they can deter people from winter wild camping. Zed from Zed Outdoors contacted me, asking me to share some advice and tips for those who are starting out with wild camping in the woods in the winter months. He had been asked several questions by subscribers to his YouTube channel and while he was happy to reply within the bounds of his own experience, one of the things I like about Zed is that he’s very honest about where he is at with his own skills and experience. He has a lot of self-awareness in this respect. He doesn’t over-extend or BS people. So, Zed asked me to chime in as well. The video below is my response and can be viewed in conjunction with Zed’s video (which I’ve linked to within the video). The content of the video also dovetails nicely with some of the questions I’ve had in recent episodes of #AskPaulKirtley, in particular Episode 19. This video on winter woodland wild camping is for anybody looking either to get into bushcraft and camping in tarps and bivvies at this stage in their lives but have little experience or for those who are used to being out in the summer months but want to progress to camping out in the colder months of the year. 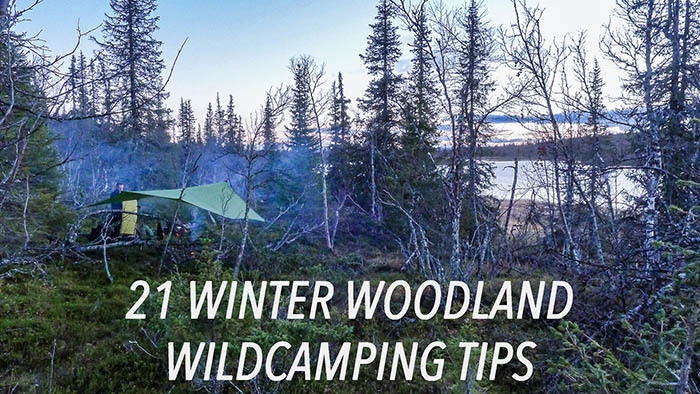 There’s some great winter woodland wildcamping tips and tricks here for everyone. In the video I share lots tips and tricks for winter camping in the woods which can be summarised as 21 Winter Woodland Wildcamping Tips. You can download the list of 21 tips via this link BUT please watch the winter wildcamping video above for detail and context. All of the points made are based on experience of camping in cold climates and cold seasons. They’ll serve you well as a guide to winter camping in temperate zones in the colder months of the year. That said, there is a good amount of additional winter camping, winter skills as well as general bushcraft and wilderness skills articles, videos and podcasts on this site, which will add to your cold camping knowledge. I’ve listed out some links below to other items on this blog, which will get you started with the relevant related material. Paul ,would have to agree with what you have said about Zed , and love his approach and the way he puts his love of the outdoors across. Thanks for another well presented video of useful tips. The tip about not breathing into your sleeping bag made me smile as I remembered a very damp bag in the middle of the night while out on exercise for the first time back in the mid 70s. I was so glad to not be the only one who had not heard of this tip. There were about half a dozen of us hoping our sleeping bags were going to be dry in time for bed!! Looking forward to your next video, thanks again and all the best, Dave. i agree too Zed is a nice guy + another point never scrimp on your sleeping gear i lived in the southern us for a while came back to the uk went to the lakes in summer whith some frends thaght id be fine whith the bag id used in the sothern states went up hellvellin (know iv spelt that wrong sorry dislexic) but annyway i got hoypothermia my own silly fault i was lucky i was whith 2 guys that knew what they was doing and im an experienced outdoorsman done it all my life but the point beeing is we all make mistakes but sleeping kit is the most important thing its a life saver. Great set of detailed Winter camping tips from a seasoned point of view too Paul, such a great season to be out, the fire really matters, organisation really counts and clear nights offer the greatest of perspective, midge free too! I shall check ou Zed Outdoors’s video too, thanks for sharing.. Yes a wonderful time of year to be out if you do it right. Only camping out in summer means one misses 75% of the year (probably more in Scotland! 😉 ). I like to have a buff pulled up over my face, covering my nose and mouth, in bed. This seems to make a real difference to how warmly I sleep. It makes a little ‘micro climate’ or pocket of warm air which actually warms each breath of air I take in. The buff does become a bit damp from condensation but very quickly dries out in the morning. I was bivving out last weekend and woke up to 3/4 inch of snow in the woods, really beautiful and well worth the effort. I think I could tick off each piece of advice from your list from experience picked up by sleeping out last winter, this time around it’s been plain-sailing, but I could have done with one or two of your tips a year ago! I’d encourage anyone who hasn’t been out in winter to pay heed to your advice and give it a try. My only additional tip would be to practice fairly near home so that it is easy to bail out if it all gets a bit too much. Great tips there chief . I also add a merino buff around my neck when it’s cold and frosty when sleeping out in cold conditions,It’s surprising the difference it makes. Your boots/ footwear builds up a lot of moisture during the day’s activities and leaving them out overnight can be a recipe for disaster, I only made that mistake once. I woke to find my boots frozen solid, having to hike the next day in cold wet boots was a miserable exsperience. If you have the room put them in the bottom of your bivi bag, or put them in a stuff sack. try to keep your footwear as dry as you can, ( an ounce of prevention is worth a pound of cure). Hi paul, all good stuff but must strongly disagree with number 17.! Eating a warm meal, gr8. But preferably with meat is a bad idea if you want your calories to keep you warm.? Even with the healthiest white meats all the energy you get from it is what it takes to digest it and red meats take calories from the other food you eat to help digest it.!!! Great blog once more Paul due to go out end of feb for long weekend in Leicestershire really useful tips. Thanks for those tips, they are just what I need. While I stopped camping in September, I am going to try to camp in the fall and at least part of the winter this year. It’s just a waste to wait for the spring and summer when there are 2 other seasons that can be utilized. Hi Paul. Great vid as always, full of new knowledge for me as a complete noob to wild camping so I apologize for asking what many will think is a stupid question but if you don’t know and you don’t ask, surely that’s more stupid, so here goes. When airing your sleep kit should you turn the bag inside out as well? It seems to me that would aid evaporation as the moisture would be closer to the inside than the out but is that correct? This is a great video having all these tips in such a nice comprehensive format. Thanks a lot! I am aiming at having a winter survival weekend in mid of February and will remember and test all these tips. Great. Thanks Paul. Really appreciate those little nuggets that an experienced professional brings to the table. It makes all the difference and I can see that they are lessons hard won, not only by yourself but all those whose footsteps we follow in. Hello Paul, As usual a great informative video,packed full of common sense and tips.I have encountered far to many people who consider winter camping the same as summer camping with snow and beer (recipe for a distressing experience ).Keep up the good work teaching folks to be aware of what they might encounter when venturing into the outdoors. I loved the video. Maybe it sounds too organized but I set up my camp with wood I bring from home a week before. I don’t want to be cold! Plus my dog likes it warm. I have a tent heater which keeps the tent cozy (I have a carbon monoxide alarm, dont worry). In the morning i first use my jet boil (recommended by you.) I would love to use an axe, but i never learned how. But since I starting reading your blogs, and watching your videos I have gotten back into camping. And experimenting with winter camping has been a lot of fun! So thank you, and please keep on going! You have obviously heard this a thousand times, however your generosity in sharing your vast experience and knowledge on your blog goes beyond generous. Many Many Thanks. Over the last two years I have walked the West Highland Way and the Coast to Coast twice. At 70 years old I have no intention of doing any long distance walk in a rush. I took 21 days to do the C2C with a 3 rest days. I figured with only 3 laundry days underclothes would be an issue. Going commando seemed to me to be a poor solution. In a previous existence I managed supermarkets. We sold disposable knickers, J Cloth material, horrible things, didn’t catch on, but would be worth a try if avalable. After much searching I found maternity briefs in Mothercare. The large size is perfect. They are in packs of six and weigh grass, 3 packs is enough for a 21 day hike. On my first C2C trip I called at Mothercare bought three packs of knickers and a last minute pot of Vaseline for the chafing issue. Arrived at the till with a questioning look from the assistant. She spoke not a word, but two or three glances first at my purchases and then at me, spoke volumes. Whatever was I going to do with 18 pairs of women’s maternity briefs and a large pot of Vaseline? I said to her “If you don’t ask a dum question I promise not to give you a stupid answer. She was still giggling as I left the store. So, 21 days wearing maternity briefs proved to be a successful idea, disposing by fire or in a handy rubbish bin on a daily basis did give me a fresh start to the day. Once again love your blog, you are a STAR. My spell check is working overtime. A pack of maternity briefs weigh grams not grass.sorry for the typo. Brilliant Paul, as usual. You are absolutely right about getting a bivvy bag large enough for the loft of your sleeping bag. Last night I was testing out my new ultra-light sleeping kit and whenever I was on my side my hip pressing upward caused a cold spot just there. This was because of my skimpy bivvy bag constricting all my sleeping kit. I did think of ejecting the sleeping mat but I always slide off when it outside the bivvy bag. I am determined to remain ultra-light weight though so what I am going to do is really take care to find a flat site and then have the mat outside the bag. Matt here from Southern California. A couple of years ago I swapped life in the Wye Valley for Life in California. With the Sierra Nevada mountains now being my playground I am learning a lot about extreme winter camping. Thanks largely to your podcasts! I have a quick question for you regarding the use of Lithium batteries. On a handful of my high altitude (10k-14k ft) trips in to the Sierras I have noticed that a vast majority of my lithium batteries have a tendency to drain extremely quickly. Including brand new back-up batteries! I know you just mentioned in this podcast that the cold can affect batteries, but do you happen to know if altitude can also cause degradation to battery life? Keep up with the great work, and I look forward to the next installment. Hi Paul, I’ve often stored a hot drink in a flask, well sealed and in my sleeping bag, or under my improvised pillow in the chance I wake up cold in the night, if you wake cold, your body reacts slower and lighting a fire at that stage could be difficult, even basic tasks. Getting a hot fluid into your core will bring you back round to working more efficiently faster and help your brain kick in to making the right choices in getting yourself warm again. Hopefully you get everything right and you don’t need the flask, but it’s a very good precaution. Thought it might help ! I’m one of these people that you refer to as “Lurkers”. For this occasion however, I felt I had to come out of the shadows and let you know that the winter camping tips episode must have been one of the best you’ve ever made. Packed to the brim with excellent advise and a useful list on top !! Please let me know how I can make a small donation/contribution, so you can continue to share your knowledge and enthusiasm. Paul thank you for sharing , a true wealth of knowledge ! You have made me a better woodsman and I thank you , and take care . great informations to campout in the beautiful winter. Also one can print out your written tips to check things days before. Great stuff Paul, once again! Got some good ideas to take along with me on our next trip to Swedish winter. Having a comfortable stay outdoors is all in the details. It’s going to be a first for me to camp out in the Winter, I’m glad I stumbled upon your blog Paul. Great take on this. Do you have any favorite equipment you’d like to share for winter camping? Great video again Paul, very concise. The 21 point pdf….genius. I consider myself pretty experienced at winter camping but it was good to hear some of your points again as they seemed to “slipped down the back of the closet” of me old mind, example being I wear Buffalo (full S6 kit) clothing and when I am out camping I am never out of it, never take it off, I even wear it in the sleeping bag (goose down bag) but only when it is dry, of course. But, I knew that about wearing little in the bag, just plain didn’t think of it anymore. I would like to add my two cents and say that I reckon the British Isles (Ireland included) are about the hardest place to winter camp in the world, it doesn’t get much worse in regards to the cold, the wet, and the wind . Also the lack of trees on the hills and mountains doesn’t help too much. (Tierra del Fuego is no joke either, but at least they got heaps of trees). You could help a few heads out (mine, as per usual) if you did a video, on starting a fire on a rainy day, sounds silly but I haven’t seen one on the interweb…ever. You know, peeling a bit of birch bark, drying it, chopping standing wood (diameter minimum etc. ), splitting it, making feather sticks, building a base for the fire, stacking it, scrapping up the bark and getting a spark to it. All done on a rainy day, wet hands, rain drops on the kindling etc, the full monty as it were. I say it because I personally would like to see/hear your tips and tricks on the subject, I do it often enough BUT I have failed in the past (Winter in the High Fens in Belgium, no birch trees…and no plan B’s) at it and I reckon it is just the hardest time to make an old fire and definitely the time one is needed the most. Thank you for the time and all the best. I am really appreciating all your great work. Thanks for your comments. I’m glad you liked the PDF. This was an experiment to see if people liked it and it seems to be going down well. So, thanks for adding a voice to this perception. I agree with you regarding the UK’s “winter” conditions of wet, cold and windy being some of the most difficult, particularly in the hills. You are not the only one to have asked of the wet weather fire video. It’s clearly something many people would like to see. The biggest issue is not, actually, the fire-lighting. The big issue is not f***ing up an expensive camera in the rain! I may just have to use a GoPro in a waterproof housing and make do with poor sound…. Anyway, that’s for me to figure out. But it’s certainly on my list. Thanks again for your comments and it’s great to receive the perspective of other people with experience too.